… and it fell apart so beautifully. A mammoth bouquet of white flowers with leaves of frosted green whose name I do not even know. I saw it sitting in a black bucket across the store and knew I had to have it. Back on the shelves went a sundry of things because I decided I needed that bouquet more than dark chocolate and such. It lasted a long time, that bouquet, and during chaotic times I could stare into its midst, with coffee in hand, and just breathe deep. And it was the breathing deep that got me in the end because after a while, darn allergies, the bouquet’s pleasant scent wasn’t so pleasant after all and so into the hallway it went. With hand over nose, I’d occasionally glance out at its soothing beauty until I needed to be soothed no longer. As it dried, it fell apart so beautifully. Earlier this spring, I found a little potato sprouting in the pantry drawer. 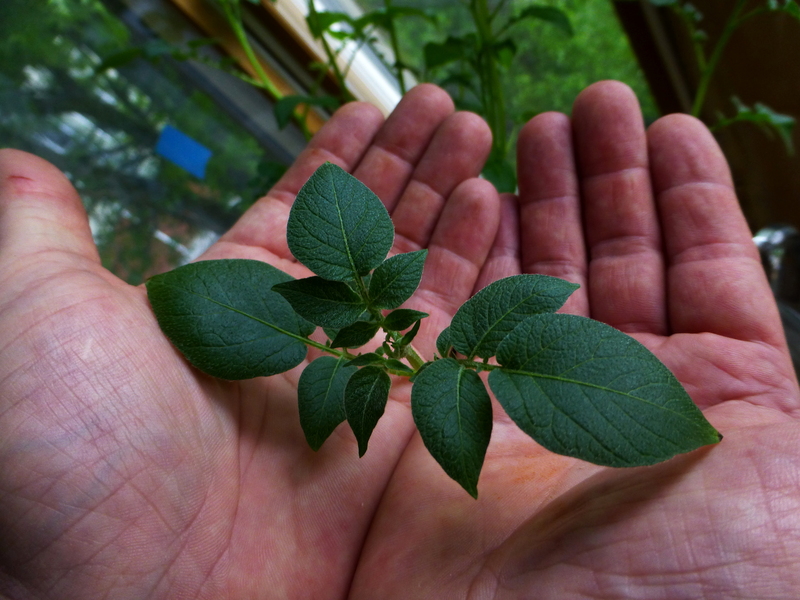 I cut up the potato and planted the sprouts in a big green pot on a table next to several tall windows. Lots of light shines down even through the widening leaves of the oak tree outside. No high hopes for a great potato crop but I did have a wee hope to see just a bit of green poke through the soil. Guess what?